But before we dive in, please make sure to save the date: June 3rd for our Annual Conference, “Emergence”. I’ll add links and more info soon, promise! And as always, get the latest and greatest from emergingsf.org and on Twitter @emergingarts. “Emerging Arts Professionals / San Francisco Bay Area invites you to an evening of open forum discussion to assess where and how R&D fits into arts and cultural innovation. We’re conducting a little R&D about R&D, with plans to create a real resource for those in the field who are interested in the now, new, and next. Who are the future thinkers in the field? How can we make forward thinking in the arts a higher priority in cycles of support? 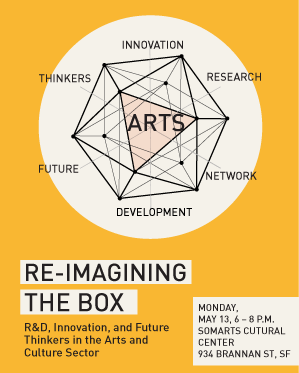 We hope to see you all there for a fun, interactive, and creative collaboration on Monday night at SOMarts. Thanks for supporting our events and stay tuned for updated event recaps soon!